Initial setup of the Galaxy Tab works best when you already have a Google, or Gmail, account on the Internet. Setup works differently depending on whether you have a cellular Tab or Wi-Fi only. When you have a Wi-Fi–only Tab, the cellular network activation stage is skipped during setup. Press the Power Lock button. You may have to press it longer than you think; when you see the text Samsung Galaxy Tab 10.1 appear on the screen, the Tab has started. 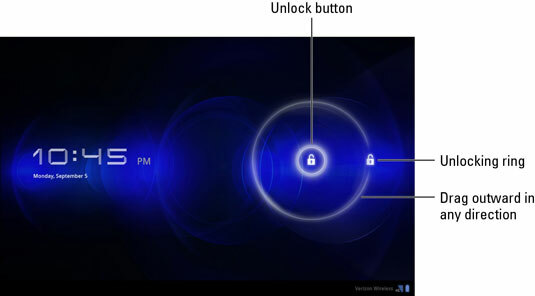 Unlock the Tab by dragging the Unlock button out toward the unlocking ring. To drag the button, touch it with your finger. Keep your finger on the touchscreen and drag your finger in any direction. The unlocking ring doesn’t appear until you move the Unlock button. Because you’re starting the Tab for the first time, you see the initial screen for the setup program. The first thing to do is to tell the Tab which language to use. Touch the Activate button to activate your cellular account. Follow the directions given by your cellular provider. Choose a Wi-Fi network from the list displayed. If prompted, use the onscreen keyboard to type in the Wi-Fi password. Ensure that there is a green check mark by the items listed on the Use Google’s Location Service screen. The two items help the Tab find itself on the Planet Earth. If the items aren’t selected, touch the little square next to each item to place a green check mark there. If prompted, enter the date and time. Wi-Fi tabs that aren’t currently connected to a network need to have their time updated. Touch the Next button again. Continue with the set up your Google account. After you activate the Tab, you see a Congratulations message. Touch the text Proceed with the Setup Process. If you have trouble activating the cellular Tab, contact your cellular provider. You need to read information from the Galaxy Tab’s box, which has activation information printed on a label. The information synchronized on the Galaxy Tab includes the following items from your Google account on the Internet: the contact list, Gmail messages, calendar appointments, etc. One of the first things you may notice to be synchronized between your Tab and Google is your Gmail inbox.